Tirtha Bridal has recently introduced its newest brainchild; a spectacular wedding garden resort located 10 minutes away from existing area of Tirtha Bridal called The Glass House. The Glass House is a distinctive resort designed by the renowned designer, Alessandro Landi from Landi Design, and Fredo Taffin as the architect for the refurbishment process. The resort does not only offer luxurious accommodation for wedding couples and their guests but also options of fascinating venues for wedding ceremonies, receptions and wonderful photo settings. Salad Dressing, a Singaporean based landscape company is in charge for the astounding landscape. The founder, Chiang Huai Yan has worked together with the Bali’s legendary tropical garden designer, Made Wijaya and developed his own unique interpretation and deep understanding of Bali’s landscape and tropical garden design. 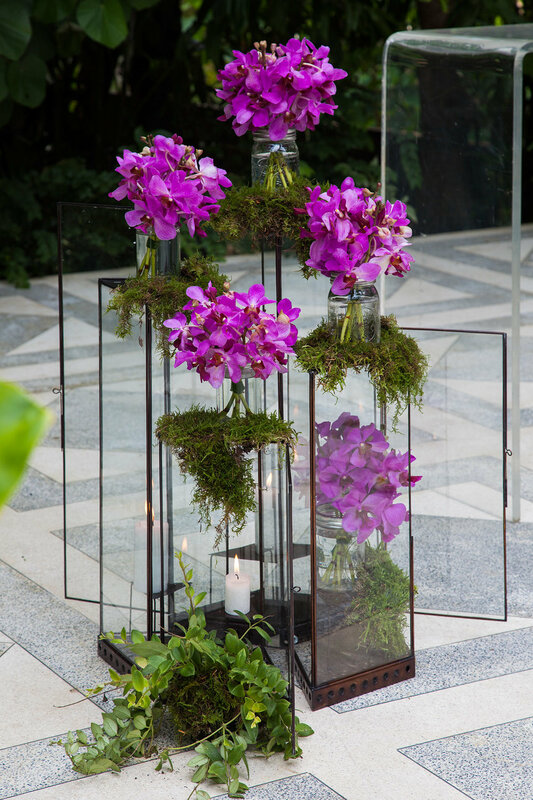 Creative and innovative handling of plants is the design ethos embedded in their practice, which makes them the perfect partner to bring The Glass House alive. The Glass House is not only about unique architecture and dreamlike garden concept but also magical ethereal play of light and colours that organically flows together with its surrounding. 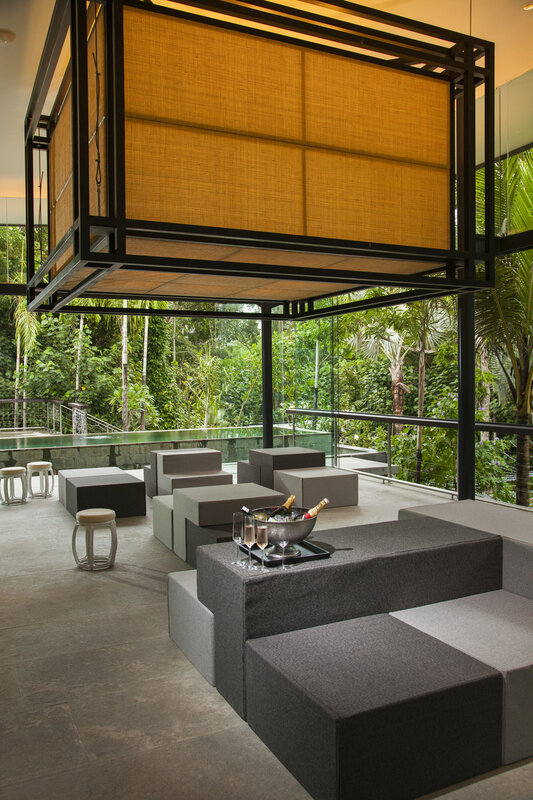 Nipek, a Singaporean base of lighting design studio is chosen to create lighting that connects inside and outside of the Glass House by balancing brightness and controlling reflections from the Glass House so to open up the views of the gardens at night. The lighting concept is designed by using moonlight and starlight effects to create visual contact with the surroundings. The villa offers 1 master bedroom and 2 bedrooms suitable for 6 people with options of ceremonial wedding venues at the Moonlight Garden or at The Plumeria room. At the same time, the reception can be arranged for an indoor or outdoor reception. Lush greeneries of themed gardens frame the whole area, such as the Black Garden that surrounds the two guest bedrooms and the Water Garden for the master bedroom. In addition, a stunning Alfresco Garden called The Moonlight Garden with a spill-out deck surrounded by glaucous plants that flawlessly reflects the scenic moon is another perfect spot for a fairy-tale like wedding. Two floors divide The Glass House, the lower floor offers a stunning Garden Lounge, master bedroom and two guest bedrooms. Moonlight Garden and its stage are also located at this floor specially catered to accommodate grandiose dining receptions with various table setting fit up to 150 people. The upper floor showcases an artistic carved entrance door with drop off zone and spacious parking space. Meanwhile, the exquisite lobby area and lobby lounge are perfect for an intimate indoor dining reception. Large enough to fit up to 40 people, it also includes the pool terrace which is another breathtaking area surrounded in greeneries which can accommodate an outdoor dinner for up to 70 people. The only thematic garden on the upper floor is the breathtaking yellow bamboo court adorned with vibrant orchids called the Yellow Bamboo Garden. 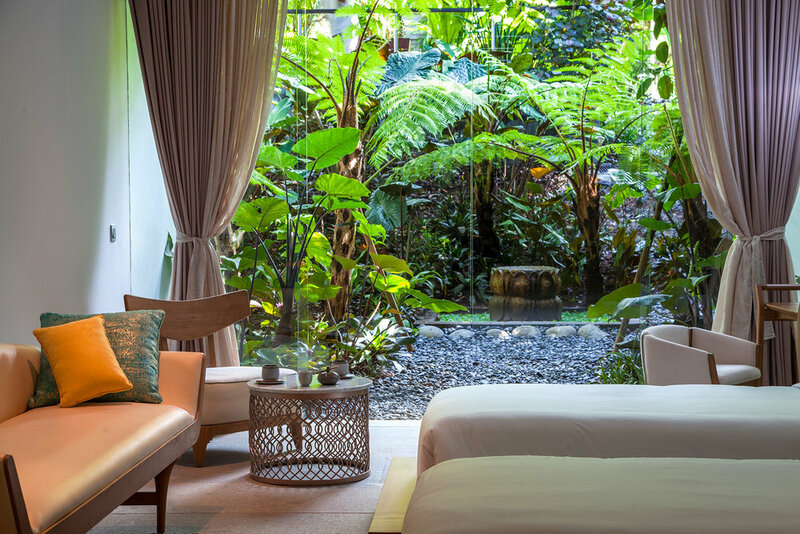 Also located on the upper floor, The Plumeria Room is another highlight of the Glass House with its breathtaking setting surrounded by glass walls allowing the feeling of being in the middle of an enchanted forest. 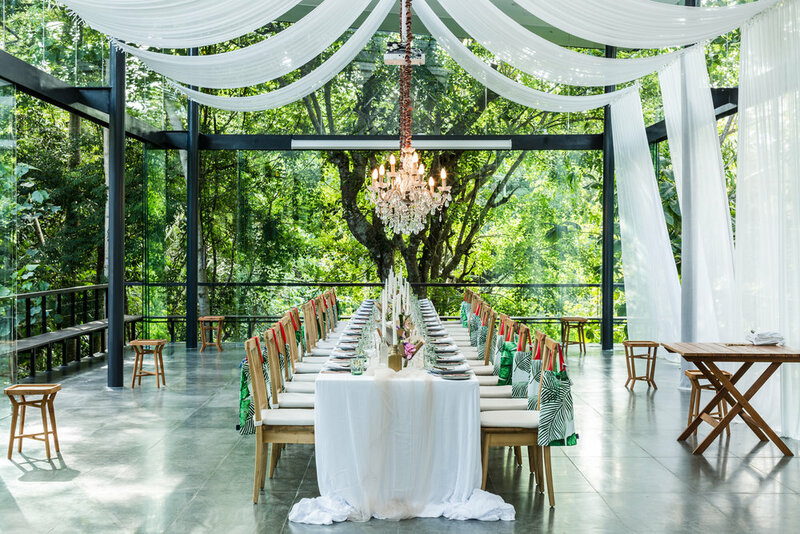 With a 180-degree view of the gardens, this light and airy room creates a heavenly atmosphere for a ceremony and a reception dinner that can seat up to 100 people. The Glass House’s suites lay dreamily in the midst of breathtaking gardens with a magnificent garden view, not to mention a 15.7m-length swimming pool with its capacious sun deck. Gorgeous wedding receptions featuring sumptuous fine dining menus specially crafted by celebrated Chef Ryoichi Kano will be held at either indoor or outdoor dining area or possibly both areas simultaneously. Becky is the manager of our Wedding & Events.